The forgery of G12 certificates in Patriotic Front party by some PF members is real and should not go unabated by the law enforcement agencies just like Stephen Masumba was jailed for forgery. The current Chingola District Chairman who also doubles as one of the Councillors, Charles Musonda has a forged G12 certificate which he used to assume to his political status currently. Surprisingly, the PF President Edgar C. Lungu is preaching against the vice while his members are perpetuating it. As if that is not enough, Chingola Police District command, Chingola Mayor Titus Tembo, PF Copperbelt Province Chairman Stephen Kainga, Chingola Council Town Clerk Kabombo Mutakela are all aware but have remained mute over the matter. 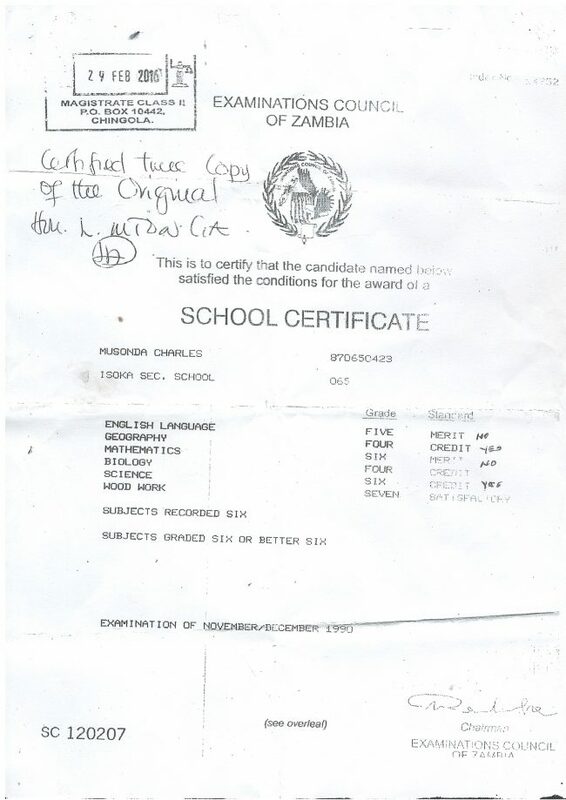 As if this was not enough, the certificate used was certified by a magistrate Court, Magistrate Mtonga of Chingola Magistrate Court instead of Examination Council of Zambia as per the requirement. If this is not corruption, then what is this. Could it mean other people are immune to arrest because they are patriotic front members? Even ACC in Kitwe are aware but have remained mute waiting for instructions from above, imagine! Are they really professionals or cadres in offices? This Councillor cannot even construct a sentence in English and is even now busy disturbilizing PF in Chingola with impunity where even Minister Nkhuwa who is aware of this forgery is so much scared of him, i don’t know for what reason. Can ACC, Zambia Police and ECZ take up this matter if really PF means well in fighting corruption and stop being a rhetoric party that does not believe in what it preaches. Attached is the same forged certificate in question to uphold this report together with genuine ECZ back leaf extract to ascertain the grades and marks appearing on his certificate that were forged. This is food for you ba ACC and Zambia Police so that we avoid being led by illiterates. He is not the only Councillor with forged Certificate at Chingola Council but the starting point is the one mentioned whose forged certificate is attached. Can the opposition political parties also take this matter up to cleanse our governance system from such people. That is evidence for you in case you are doubting and want evidence.